Have you been tuning in for the Live recipe demos? I’ve been doing them every week on Thursdays at 11am Eastern time. They are SO MUCH FUN! You can view them on my Facebook page or on Instagram stories. They only hang around on Instagram for 24 hours, but I’m able to save them on Facebook forever! I’ve been having a blast with these, it’s so much fun to be able to interact with readers in real time! And as I’m going along, I always think of great tips & tricks; it’s so great to be able to share them before they fly right out of my head! Plus, there’s always a lot of general baking questions that I really enjoy answering. Anyhow, the reason I bring it up is because a couple of weeks ago I debuted my latest and greatest cupcake recipe there. It’s actually an old recipe that I keep tweaking, but I finally have it exactly where I want it, and I’m completely obsessed! It’s SO EASY to make (I’m talking one-bowl wonder here), and the result is spectacularly moist, light, and flavorful. This vanilla cupcake recipe is buttery and delish, with a fine crumb that’s exquisitely delicate, yet sturdy enough to stand up to all sorts of fillings and toppings. 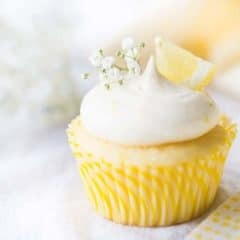 I’m so thrilled with this recipe, it’s inspired me to play around and create the luscious lemon cupcakes I’m sharing today! So, I started with that vanilla cupcake recipe, and just made a few easy swaps. Instead of vanilla, we’re using a combination of lemon zest, lemon juice, and lemon extract. There’s no doubt about it, these are LEMON cupcakes. You can taste that bright, citrus flavor in every bite. To really up the lemon game, fill them with lemon curd. This component is completely optional- you can leave it out if you want! But I love it soooo much. Any excuse for lemon curd, lol! It’s a cinch to make (just whisk everything together over a double-boiler), and the lemon flavor is totally off the charts. 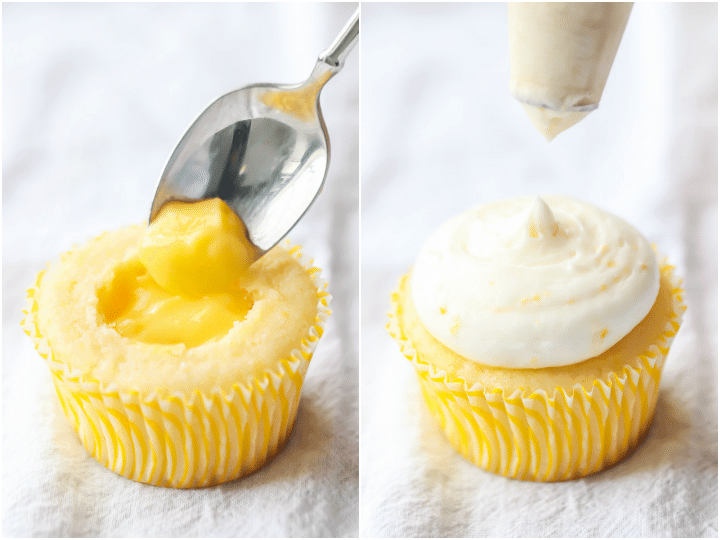 Use the point of a sharp knife to cut a little hollow in the cupcakes, and spoon in the lemon curd filling. If you don’t have time to make homemade lemon curd, store bought will work fine! But I love the rich flavor you get with this lemon curd recipe. Finally, top the lemon cupcakes with a tangy cream cheese frosting. Lemon and cream cheese taste so good together! This frosting is a perfect compliment. I’ve added a little extra lemon flavor to the cream cheese frosting from my favorite red velvet cupcakes recipe, and it’s so on point! Lemon lovers, rejoice! 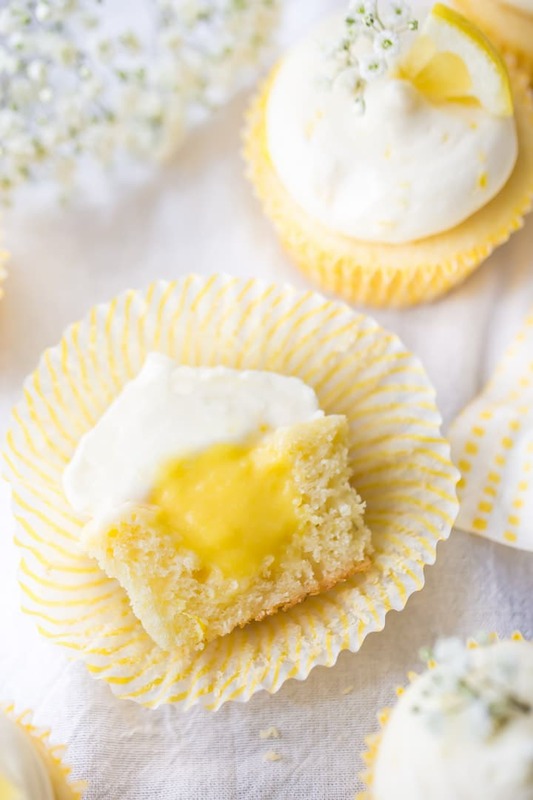 These lemon cupcakes have your name written all over them. So bright, cheerful, and citrus-y! I really think you’re going to love them. 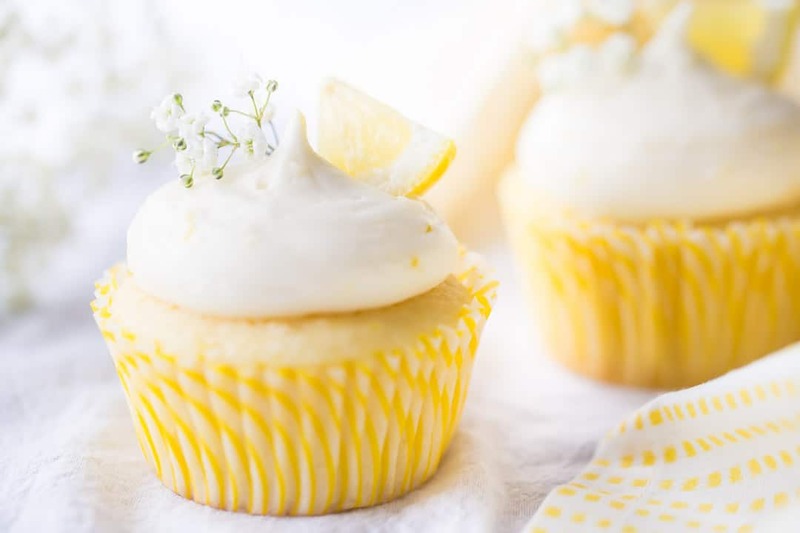 If you love lemon, then these lemon cupcakes are for you! The cake is moist, light, lemon-y, and filled with a bright, citrus-y lemon curd. Top them off with a tangy cream cheese frosting. They'll be the hit of the party! Preheat the oven to 350 degrees F, and line cupcake pans with cupcake papers. Place the cake flour, all-purpose flour, sugar, baking powder, baking soda, and salt in the bowl of an electric mixer, and stir on medium-low speed to combine. Add the softened butter, and mix on medium speed until the mixture resembles damp sand (about 2 to 3 minutes). Scrape the bottom and sides of the mixing bowl with a silicone spatula, then add the Greek yogurt, milk, lemon zest, lemon juice, and lemon extract. Beat on medium speed for 1 to 1 1/2 minutes, to aerate the batter and build the cake's structure. Evenly distribute the batter between the prepared cupcake pans, and bake for 16 to 20 minutes, or until a toothpick inserted in the thickest part of a cupcake comes out clean. Cool the lemon cupcakes completely, then use the tip of a sharp knife to cut a well in the center of each one. Fill with lemon curd, and top with lemon cream cheese frosting. In the bowl of an electric mixer, beat the butter on medium-high speed until smooth (about 2 minutes). Add the cream cheese, and beat together until incorporated (about 1 minute). Add the powdered sugar, 1 cup at a time, starting the mixer on low speed and increasing to medium-high as the powdered sugar becomes incorporated. Stir in the lemon zest and lemon extract until combined. Transfer the frosting to a piping bag fitted with a jumbo round tip, and pipe the lemon cream cheese frosting onto the filled lemon cupcakes. *If you don’t have buttermilk, you can substitute by stirring 1 tablespoon of lemon juice or white vinegar into 2/3 cup of regular milk. Allow the mixture to stand for 5 minutes, or until thickened and slightly curdled. Story, I meant approximate, not appropriate! No worries Laurel! Most lemons have about 2 to 3 tablespoons of juice in them, and about 1 tablespoon of zest. Hope that’s helpful! 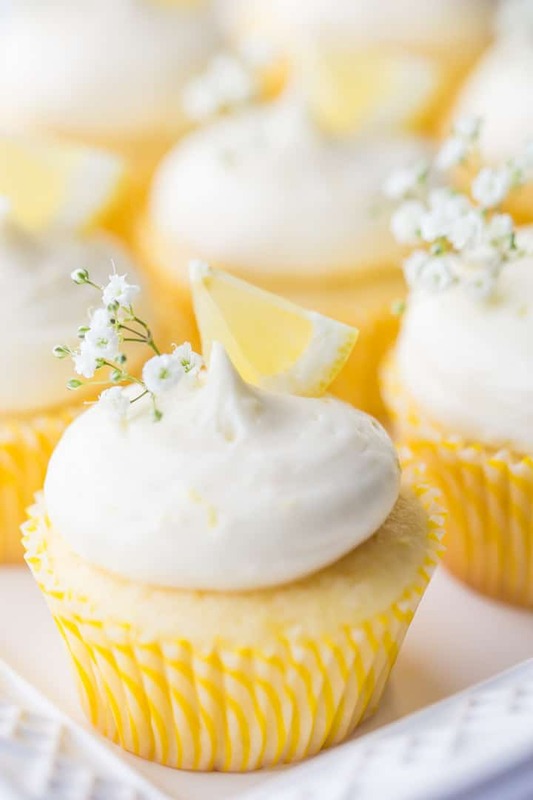 We LOVE these lemon cupcakes and they are so pretty to look at! I’m so glad! Thanks so much Alyssa! Thank you. And I meant sorry, not story! Spellcheck is having a field day with me! Reminds me of the cupcakes my mother used to make. She used Jello lemon pudding for the filling. That was the cool thing to do way back then. These look super delicious..
That’s such a nice memory! I bet they were fantastic! Allie, these cupcakes were literally one of the best things to come out of my kitchen! I have made quite a few of your cupcakes (and others’ cupcakes) in the past (e.g. simply perfect chocolate, simply perfect vanilla, etc. ), and EVERYONE that tried these said they were the best cupcakes I’d ever made! They were so perfect, and so easy! Thank you so so so much!! I left the lemon curd out (b/c I didn’t have any and didn’t feel like making it), and they were STILL sooooo amazing! Thank you thank you thank you!!! Hooray!! So glad you liked this recipe Daphne! I really did too. Thanks so much for the great feedback! I made these this weekend, and they were a hit! I only took twelve to my party and that was a mistake! I made lemon curd in my instant pot the day before, and to anyone reading these reviews, don’t skip this step! It’s so worth it. The icing, for me, would have been too sweet without the tart curd as 4 cups of sugar was a lot for me for a cream cheese icing. I’ll definitely make these again though I might play with the sugar amount in icing a bit. Sounds great! I’m so happy you enjoyed the recipe, and I totally agree with you about homemade lemon curd. It takes everything to the next level! How do you make a half batch of lemon curd when you need 3 eggs and 3 egg yolks? You’d have to weigh the ingredients with a kitchen scale. Hi Allie! Just wondering if this recipe can hold up in a 6″ pan instead of cupcakes. My friend wants a simple lemon blueberry cake, and I of course went straight to your site for inspiration(I love all your cake recipes – they’re so hardy and so so so delicious). So I was thinking I could toss the blueberries in cornstarch or flour to keep them from sinking and use this cake recipe. What do you think? Hey Olivia! I think that would work well. You will need (3) 6-inch pans to convert this from cupcakes to a layer cake. The bake time will likely be in the neighborhood of 20-25 minutes, if you bake them at 325 degrees F. And you definitely have the right idea about tossing the blueberries in flour or cornstarch first. If you don’t already have a frosting in mind, I’d suggest this one: https://bakingamoment.com/whipped-cream-frosting/. It’s nice and light and would complement the fresh flavors beautifully! So happy you are enjoying the recipes! Thanks so much for the good feedback and enjoy! Happy birthday to your friend! I can’t wait to see! Thanks so much Olivia! I made these this weekend and they were delicious, especially with the lemon curd. However, my cupcakes turned out rather dense and heavy. Any ideas as to what I did wrong for them to bake heavy? Thanks! Hm that’s surprising- I make this recipe often and one of the things I love about it is how light and soft the cake comes out. Is it possible they could have used a few extra minutes in the oven? Or perhaps the batter was overmixed and the glutens in the flour tightened up? Hey! These look amazing. I had one question – I am just wondering if I can replace the lemon extract? I don’t have time to order it online and am unable to find it anywhere locally. Thanks! Hi Dee! What were you hoping to replace it with? I think you could probably use any kind of extract you like. Just add it to taste. Good luck and enjoy! I’ve made your vanilla cupcakes and they are wonderful! My daughter-in-law wants a lemon cupcake with a strawberry cream cheese frosting to make kind of a strawberry lemonade mix. 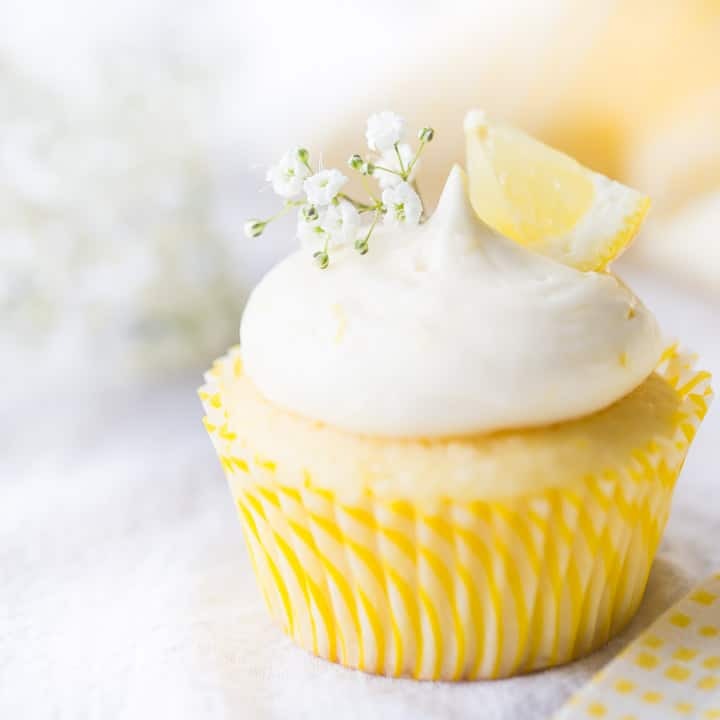 Do you think this lemon cupcake recipe is a good choice, and would you put the lemon curd in if you were going this direction? Hey Robin! I think this is a great recipe for that. You can do it with or without the lemon curd- totally up to you! I do feel like the lemon curd adds an extra punch of lemon flavor so if you’re DIL likes a lot of lemon then I’d say go for it. You might want to check out the frosting component of this recipe as well: https://bakingamoment.com/strawberry-cupcakes-with-strawberry-swiss-meringue-buttercream/. I am very new to baking and thought I would try you chocolate cupcakes. I live in Australia and wondered to which extent our cup sizes would differ from that of America. I am looking at the simply perfect chocolate cupcake recipe and wondered if you could provide the grams as well as I think our cup size may be slightly smaller than yours. Hi Terri! I’m so glad you are going to try this recipe. I think you will love it! 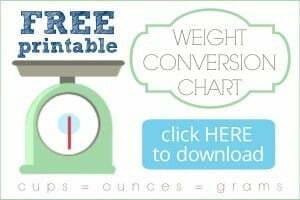 If you are looking for metric measurements, just click over to the free weight conversion chart. If you are on desktop, you’ll see the link in the right hand sidebar of this site. If you are on mobile, it gets pushed to the bottom of the screen. Hope that’s helpful! These look absolutely delicious. I’ve been trying to find a lemony recipe and one that the cupcakes don’t fall when they come out of the oven. My question is do these have to be refrigerated either due to the lemon curd filling or cream cheese icing? Thank you! Hey Pam! I think you’ll be happy with this recipe. If you’re concerned about the cake falling, just make sure they’re fully baked before you pull them from the oven. Nine times out of ten that is the cause! It’s probably a good idea to keep these refrigerated. They can sit out at room temp for a couple of hours, but anything more than that and you have to be concerned about the yolks in the lemon curd starting to turn. 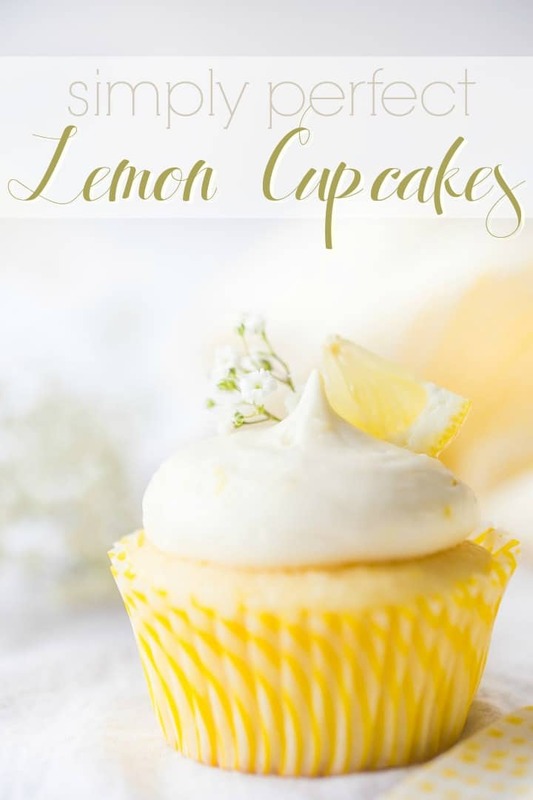 Hi, this recipe looks fantastic, exactly what I was searching for in a lemon cupcake! However I’m from the UK and we use metric measurements… Would it be possible to get the metric measurements for the ingredients? Absolutely- just click the “metric” button just below the list of ingredients. Does this delicious looking recipe double nicely or do I need to adjust the ingredients? Thanks for sharing j. Can’t wait to make these!! Hi Deb! I think it should double just fine for you. Good luck and enjoy!